1) Shipping and freight cost. Most of the EV components have to be ordered from the manufacturers. Is you are located in the United States, this may not be an issue. However, if you are located outside the US, shipping and freight costs can be substantial. Some of the components for an electric car such as deep cycle batteries, electric controller, power cables etc can be purchased locally. There is one major component that you would have to get it shipped from overseas. It is the electric motor. These electric motors are heavy. Some weighing 40 kg and above. That’s the reason why is will be costly when you purchase the motor. Most of the top rated electric car motors are manufactured in the US, hence you have no choice but to pay a premium price for it. 2) The strength of your currency. When you are buying parts from overseas, the strength of your currency will also play a part in the final costing. If the US dollar is weak versus your country currency, sorry to say, you’ll be spending more money on your EV conversion project. Some of the components in your EV have to be custom made. For example, the battery racks and the motor-to-gearbox adapter plate. If you are good in welding, you can make the battery racks yourself. If not, you may have to engage a professional welder. Obviously you have to pay him for his service. Most probably you would have to outsource the work to make the adapter plate also. Unless you are a machinist and you have tooling equipment in your garage, you have to outsource this portion. Cutting a piece of 1 inch steel plate is not an easy task. Be prepared to pay a high labor cost to get the adapter plate made. 4) Cutting, welding or crimping battery cables. Some people would do this portion of the EV conversion task themselves. Some people would rather outsource it. Remember, the main power cable is the fuel line for your electric car. You want it to be cut and crimped properly. To save cost, you can do it yourself. But the drawback is, there are more than 50 cable joints you have to tackle. Are there anyway ways to reduce your electric car conversion cost? As a matter of fact, there are. Check out Gavin Shoebridge’s Electric Conversion Made Easy e-book. Gavin has converted his old 1987 Mitsubishi Tredia into a pure EV on his own. Most of his EV task is based on trial and error. In the end, Gavin managed to get his EV done with relatively low cost. Gavin’s manual is full of tips and strategies on how you can reduce your conversion cost. ==> Click here for Electric Conversion Made Easy instant access! 1) NetGain Motors Inc – Distributor of Warp hybrid and electric vehicle motors. 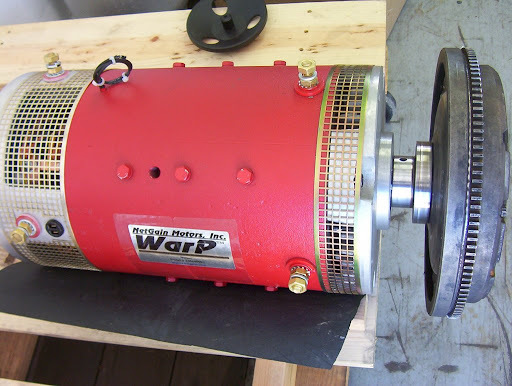 Would that be a good EV motor Its build for continuous operation and is 1,800 rpm. Another question is : Hot does a potbox hook up to a AC 1,800 rpm motor through its controler ,and be able to effect the Motors speed? I have a 1957 Morris Minor ,I am hoping to build it into a EV vehicle ,but this motors Higher voltage would take a lot of batteries for it to function properly! Yes? As for a DC Motor I’ve seen some Motors that have the Armiture Shaft sticking out Both ends of the motor ! I thought it might be possible to run a couple of Automotive Alternators form a double pully off the back end of the motor! When engaging the brakes the first movement of the brake peddle could trigger a switch that would make a contact to an old air conditioning pully engaging the 2 alternators connected with belts to the motors outer pully hopefully slowing the car a bit and charging power back to the batteries!!!! That’s what I would try to do if i use a DC motor !!! But how could a couple of Alternators produce enough Voltage to recover some power to that many batteries hooked together?? or is that an impossibility? Firstly, regarding the AC motor, as I know, it is much more complicated to install compared to a DC motor. AC motor no doubt is more efficient, but the down side is its complexity. In regards to your regenerative braking system, it does not generate a lot of power to recharge the battery. But it does produce a small amount of power. That’s up to you actually. But it does require a lot additional work and parts. Moving parts have a tendency to fail.